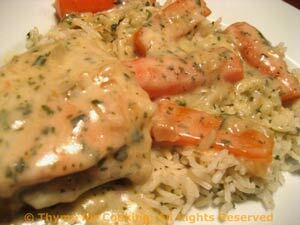 Thyme for Cooking Dinner tonight: Creamed Chicken and Carrots on Basmati. I was on a carrot kick this week, as I bought a large bag because of the stew. And this was easy. In fact, I'm feeling guilty because it was so easy.... This is meant to use up the last of the yogurt; if you don't have any you could substitute milk for half of the chicken stock, and/or add one more tsp mustard. Another skillet dinner: cook the chicken and carrots together and serve over rice. And, it's yogurt, not cream, for a healthier finish. Peel and cut carrots into 2" (5cm) lengths. Cut each length in half or quarters, depending on size. Cut chicken breasts in half the short way. Add onion, garlic, and sauté until tender, 4 - 5 minutes. Add chicken and brown lightly, about 3 minutes per side. Add carrots, stock, mustard, herbs, cover and simmer until chicken is done and carrots tender, about 15 minutes. Dissolve cornstarch in water and stir into skillet. Remove from heat, stir in yogurt.